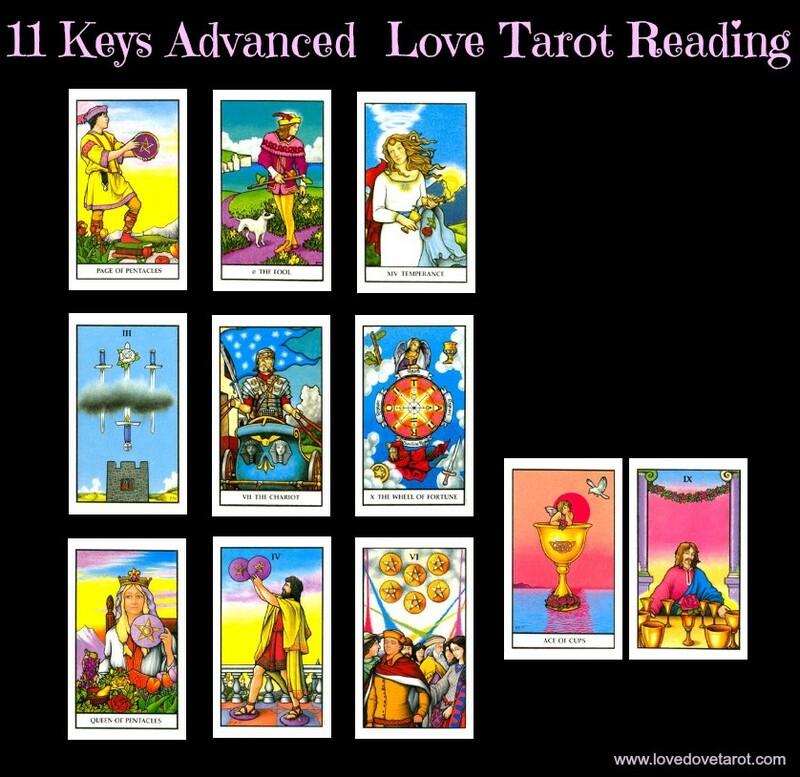 This advanced Tarot spread is inspired by years of reading the 9 Square intuitively, observing patterns and listening to the whispers of the cards themselves. 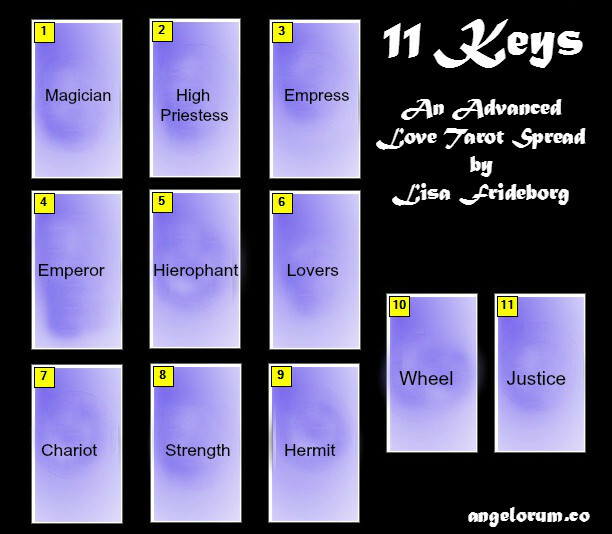 In the past few months, I have felt a need to add two cards to the square when doing love Tarot readings… and then one day the penny dropped: each of the card positions correspond to Major Arcana 1-11, with the Hierophant as the central card and Justice as the outcome. In other words – perfection in terms of looking at long term potential with the Hierophant and Justice being two of the main marriage cards. 1. House of the Magician – Expression of masculine energy in the relationship. Point of initiation. The beginning. Ability to give love. Communication. 2. House of the High Priestess – Receptivity. Intuitive guidance. What your gut is telling you about the relationship. Ability to receive love. 3. House of the Empress – The quality of nurturing inherent or lacking in this relationship. The chaos element. Mother issues (his or hers). 4. House of the Emperor – Leadership ability. Organisation. Protection. Father issues (his or hers). 5. House of the Hierophant – Long term potential is seen is this central card. How one or both feel about commitment. 6. House of the Lovers – How you connect at the level of the heart. 7. House of the Chariot – Potential power struggles. 8. House of Strength – Lust, sexual attraction and also your ability to ‘play’ together. 10. House of the Wheel of Fortune – The fated element. What the next turn of the Wheel is likely to bring. If one of the karmic cards are found here (Wheel, Moon, Justice, Judgement, Devil, Tower & The World), what happens next is predestined and cannot be avoided. 11. House of Justice – Most likely long term outcome for the relationship. Read together with the card in the House of the Hierophant to see if marriage/settling down together is a likely outcome. Each card becomes a key that unlocks the full meaning of the house in the context of the relationship you are reading on. Temperance in the House of the Empress is a good sign that the relationship brings healing with regards to mother issues for one or both people in this relationship. 3 of Swords in the House of the Emperor indicates that one of the main challenges in this relationship is father issues, which seems to interfere and bring an element of emotional distance to these lovers. However, the awareness of this can bring healing. The Chariot in the House of the Hierophant together with the 9 of Cups in the House of Justice tells us that while they may not agree completely on commitment at this stage, the outcome will be a happy one. The Queen of Pentacles is the significator of the Seeker for this reading and is found in the House of the Chariot. It could indicate a need to stop trying to control the flow of events. As we have the Wheel of Fortune in the House of The Lovers, it is easy to see that these two feel expansive and optimistic in each other’s presence. There is a spirit of travel, adventure and good fortune in this relationship. Other than reading the individual card interpretations together with the House positions, I do recommend reading the 9 Square intuitively as a tapestry. Combining both methods will give you layers and layers of information about this relationship. Hope you enjoy playing around with this spread. Feel free to ask any questions in the comments section below. I won’t have time to do whole spread interpretations but am happy to answer questions about individual card meanings for the Houses.